The first Jazz and Citizenship Educational Camp at “Instituto Indigena Santiago” in Guatemala City, in collaboration with FUNDADELA (Friends of the Art Foundation), AJEDE (State Alumni Association), and the US Embassy in Guatemala from November 30th to December 4th, 2016. This five-day event, allowed the participants and community, to participate in different cultural activities and workshops to know more about their rights and citizens of a country and musical techniques. The “International Jazz and Citizenship Educational Camp” aimed to exchange Jazz techniques and citizenship education experiences to help Guatemalan citizens to know more about their rights through Jazz music, to create the first Big Band of Jazz music in Guatemala, and to have concert to get people involve in this camp. The beneficiaries were 60 students over 15 years old, 6 access alumni counselors and 7 teachers from all over Guatemala who were interested to learn more about Jazz music and citizenship education. The US Embassy in Guatemala collaborated by bringing three international professors, LaFrae Sci, Lakecia Benjamin y Nicki Denner, who have previous experience in facilitating workshops to promote mutual understanding between the American cultures and Guatemala. Also, they helped to create the first Jazz Big Band in Guatemala. On the other hand, FUNDADELA (Amigos del Arte Foundation) brought Orantes Machado from Cuba to teach some techniques to the trumpetists in collaboration with Fulbright alumnus Jacobo Nitsch. To create physical and emotional space for the environment of creativity and a peace culture through Jazz Music. 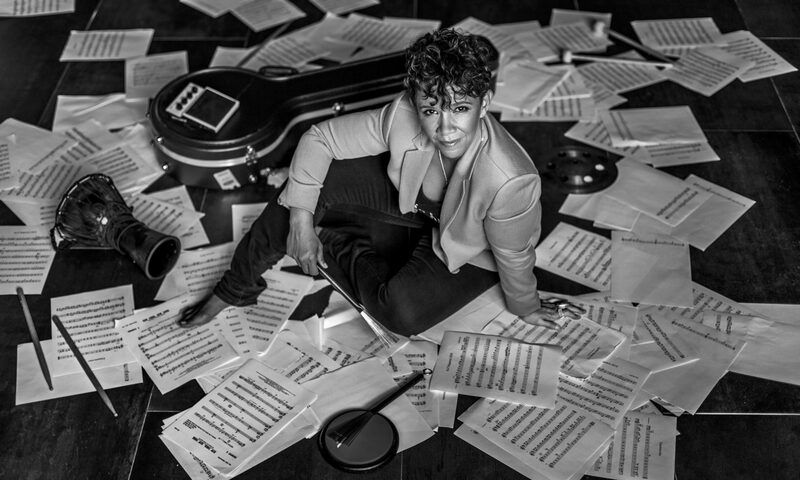 The participation of the American female’s drummer LaFrae Sci, saxophonist Lakecia Benjamin, and pianist Nicki Deneer, in the International Jazz and Citizen Educational camp allowed the 60 members of the camp, mostly youth between 15 – 33 years old, to experiment the art of improvisation. These workshops, focused on creativity, find their inner voice and freedom of expression through knowing more about their rights. So, this allowed boys but most importantly girls to express themselves through the jazz music. To create the first Jazz Big Band in Guatemala with students from all over Guatemala. During the camp teachers had the time to get to know the participants and, their skills, personalities and technique, which allowed teachers to choose the best of the best participants to be part of the first Big Band in Guatemala. To choose was not easy, but at the end teachers per their specialty chose the participants who would be part of the band and would play 3 special songs in the festival. The big band were formed by 35 participants (3 singers, 3 drummers, 9 saxophonists, 6 trumpets, 5 trombones, 2 pianists, 1 clarinet, 4 guitars, and 2 basses). Increase the performance of Jazz in Guatemala and train students and teachers in Jazz music and Integrate students and professional jazz musicians from Guatemala and the United States in a one-day Jazz Festival. Even though jazz music was born two centuries ago, Guatemala does not have a formal Jazz school to allow artists and people in general to be involved in this genre. However, there is too much instrumental talent in Guatemala that it was necessary to learn and know more about the jazz history and its technical execution. Participants were so grateful to have the opportunity to learn from the best teachers in their specialty and learn more about another artist like them. Also, the camp was very successful because participants and teachers were exchanging knowledge and techniques to improve the way the play their instruments. Promote mutual understanding between the United States and Guatemala through music. Through a variety of workshops during the jazz and citizenship educational camp promote dialogue between the participants and teachers from Guatemala, Cuba and United States. This is the perfect example of the power of unifying efforts and the unique opportunities they have to share ideas, thoughts, musical techniques and create connections between themselves to create a better country to live in. Promote the participation of women in the first Jazz Big Band in Guatemala. The US embassy in Guatemala collaborated to bring the American drummer, LaFrae Sci, pianist Nicki Deneer, and saxophonist Lakecia Benjamin. So, they talked about how music can be a neutral space where we can express our rights and ourselves without racism or discrimination, but also to talk about peace and good things. Although there were just 6 girls participating in the camp, they showed their interest to learn more about jazz through the camp activities, workshops and concerts. Create awareness of Guatemalan rights and democracy through workshops about Citizenship Education and Jazz Music. By learning about democracy and their rights, participants create a more secure, Bureau of Educational and Cultural Affairs · Office of Alumni Affairs stable and peaceful environment that they can easily put in practice in other places when they go back to their real life. It was interesting to heard participants’ opinions about certain topics and how they can use music to create a more democratic country and to know they rights as woman, men, children, etc.